This is my new favorite pasta salad. It is so easy to put together and is such a crowd pleaser. This tastes best during asparagus season, using fresh local spears. I used Alaskan baked salmon, which is a prepared food, all natural and lightly smoked. It is vacuum packaged and you can find it at most good appetizing stores. It is also known as hot smoked salmon. 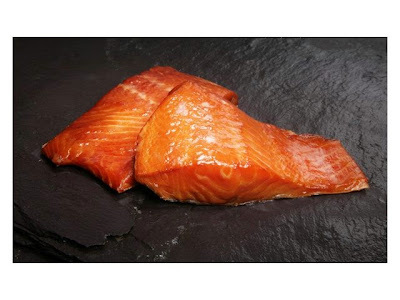 FYI: Whole Foods, Trader Joe's, Costco, Duck Trap River Farms, Pike's Fish Market in Seattle, Russ & Daughters in NYC, and many other specialty food stores sell this type of smoked cooked fish. You could also use regular Scottish salmon that has been grilled or baked in the oven, or smoked salmon (a.k.a. "lox") if you like, but it's the baked hot smoked salmon that makes this dish what it is. and while I am being bossy, it's called a vinaigrette (French: pronounced vee/neh/greht and say it like you are gagging), not Vinegar-ETT! You can make this in the morning and bring it to room temperature before serving. I love this, it's my new favorite. Whisk the vinaigrette and set aside. Boil the pasta in salted water and cook per package directions. 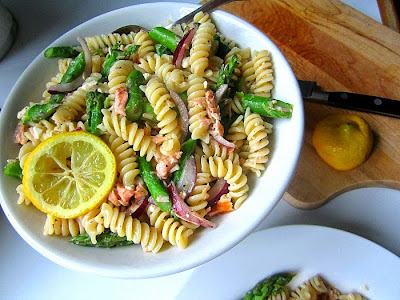 So I don't have to wash another pot, I drop the asparagus spears into the pasta water and boil for 3 minutes........I remove them to an ice bath immediately with tongs, and let the pasta cook for the remaining time. The ice bath will set the green color and stop the cooking process. Slice the asparagus spears on the diagonal into pieces and add to a large bowl. 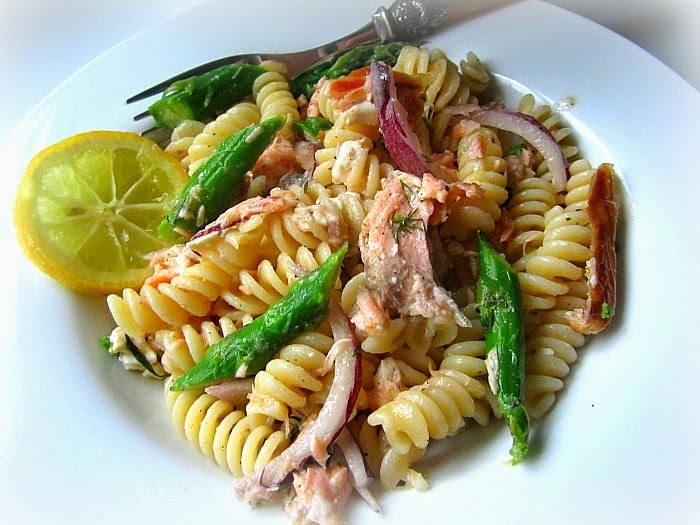 Flake the baked salmon into pieces and add to the bowl along w/ the red onion slices. Drain the pasta and rinse to remove the starch. Add the pasta to the bowl w/ the rest of the ingredients and pour the lemon dill dressing over everything and toss. 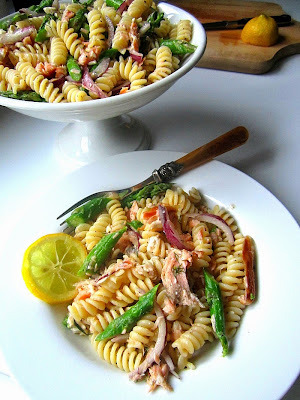 I love how you write - drop the asparagus spears into the pasta water so as not to wash another pan - I am SO like that as well! (hee-hee). The feta - do you sprinkle it on top of the salad or mix it in with the dressing? Salad sounds delicious for a warm summer night. FINALLY - the scoop on that beautiful salmon. Yes I do love you. Thanks Ms. Snacks!!! VINEGAR ETT! ha! I love it! The other way not to dirty a pan for the asparagus is to use the Alton Brown trick: wrap the bunch in a layer of damp paper towels and microwave 5 minutes.